President Obama, as usual, is blameless for any misfeasance and malfeasance of the Government he allegedly leads. Let’s make it easier for him by making it simpler and smaller. WASHINGTON (AP) — The Justice Department failed to provide the names of some terrorists in the witness protection program to the center that maintains the government’s watch list used to keep dangerous people off airline flights, the department’s inspector general said in a report Thursday. As a result of the department’s failure to properly share information, some in the witness protection program who were on the “no-fly” list were allowed to travel on commercial flights, the federal watchdog said. “It was possible for known or suspected terrorists to fly on commercial airplanes in or over the United States and evade one of the government’s primary means of identifying and tracking terrorists’ movements and actions,” the report said. At first, I wondered whether the Justice Department just needs more funding and more employees. That has been the traditional solution to our problems. Then, a better idea came to my attention. It involves a brilliant new solution that nobody had ever suggested before David Axelrod thought of it. 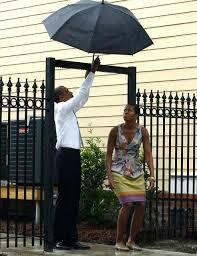 As loyal subjects citizens, it behooves all of us to help President Obama and his friends out. According to Mr. Axelrod on May 15th, things are far too complex these days. That must be the problem as well as explanation for all of the recent scandals and more that will arise unless we do something. It is shameful – shameful — that no Republican or even conservative has ever suggested that the Government should cease growing and even be reduced in size and scope. It is doubly shameful that dear Mr. Axelrod had to be the first person in history ever to summon the courage to say it, but he did. His wise words should serve as game changers, helping Republicans and more vocal conservatives to recognize that they alone have failed us completely. ObamaCare is probably the most inefficient, but therefore nevertheless most highly effective, expansion mechanism ever devised by Government. Why did no Republican or conservative bother to oppose it? What? There was? In 2010? But why has there been no opposition or even one effort to repeal it? Huh? Well, OK. But it must have been done incompetently. Ditto enhanced borrowing and spending authority for the Government. Deafening silence. Wasn’t there? Oh. Yeah, there’s that but it’s probably our fault anyway. 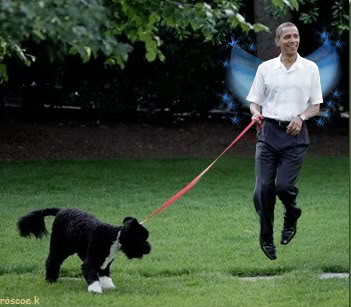 Besides, with Government growing as fast as it does, it obviously needs lots of horse manure yummy stuff from the ObamaStash to feed it; providing that is the President’s only principal job. Isn’t it? It takes a big brave man to nurture a monster of that size! The ever growing nature of the Federal Government is, of course, not the fault of The Brilliant Light Bringer for whom we had long been waiting. His legacies of screwing medical care and helping al Qaeda to thrive have preoccupied him to the extent that he can no longer even come in out of the rain. I missed a hole in one by just this much! He had had difficulty with rain before, but now the paralysis has progressed and he can’t even manage to get the podium moved a few feet back under the overhang. In simpler times, a President could have managed that with just a whisper to one obtuse underling; no longer. There are too many of them. Now it would require drafts and multiple revisions of talking points and policy statements from and by many bureaus and agencies. Legal review by the diligent protectors of our laws and Constitution at the Department of Justice would be necessary as well. Their workloads are already overwhelming so it would take at least until after the 2014 elections to get the podium moved a couple of feet. 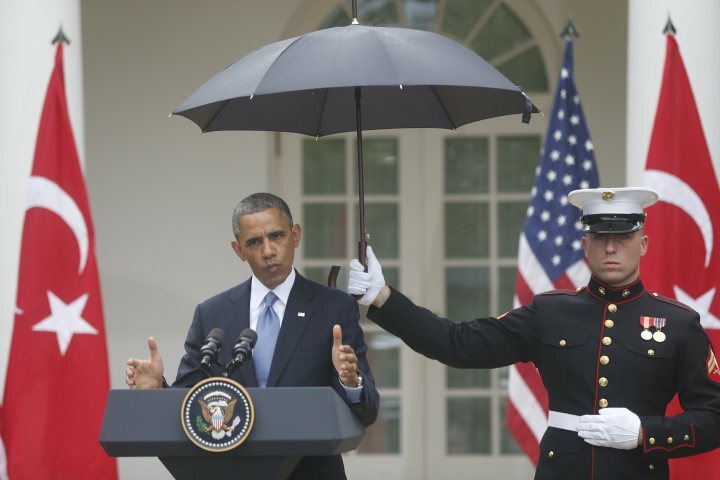 President Obama has no choice but to stand in the rain for us, protected by a lowly Marine corporal. 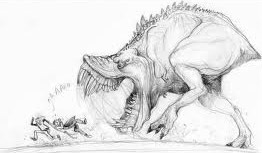 We must all pitch in and help to get the Ravenous Bugblatter Beast of Traal under control. Should we fail, it might eat our beloved President and members of the Congress. How could the nation possibly survive without them? Surely, we need their vast wisdom and unparalleled experience to survive. Perish any thought of feeding the Beast! Let’s all ask Big Bird for the help we so desperately need and which he alone can easily provide. 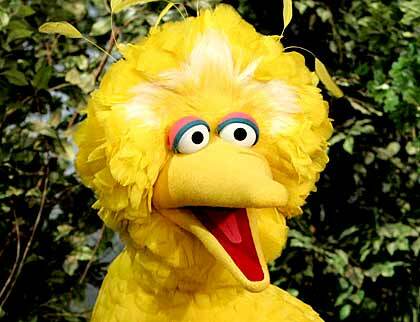 Big Bird for President in 2016!